Other photos: Photo 1, Photo 2, Photo 3, Photo 4, Enjoying Bahamas, Aft-Stbd, Underwater lighting, STBD profile, Forward Custom umbrella, Black and white, Sunset on the AWLGRIP paint, Photo 12, Photo 13, Bow Custom Umbrella, Photo 15, Photo 16, Twin Anchoring system, Bow storage access, Port aft view, Wide walkways, Cockpit seating options, Second option, Aft port+Stbd have winch, cleats and storage, Third control station aft Stbd, Saloon all opened up, Saloon, STBD side, Port, Stbd, Stbd aft facing, Samsung 4k 50" pop up, Photo 32, Saloon aft view, Stairway to owner's quarters, Photo 35, Closed off for privacy, Main dining table for 8, Stairway to owners/guest quarters, Master stateroom, Master Stateroom, Master, Master Head, Master head, Master head, Hallway facing forward, STBD side guest head, Port guest cabin, Port guest cabin, Port guest cabin, Port guest head, Stbd guest cabin, Stbd guest cabin, VIP suite, VIP suite, VIP suite, VIP suite, VIP suite, VIP head, VIP head, Details - hand shower, Day Head on main deck, Breakfast area just aft of galley, Elevated helm area for better visibility, Captain's helm chair, Main helm, Aux Garmin unit 7612, ZF controls, Breakfast area, 2 steps down to galley, Miele oven- microwave, Bosch 4 burner cooktop, Dishwasher - Miele, Full size GE fridge/freezer, Galley and crew area can be closed off, Captain head, Captain's stateroom, Crew head, Miele dryer, Miele washer, Crew quarters twin bunks, Looking from galley aft, backside of main helm, Interior access to flybridge, Stbd side MTU 12V2000 M94, Port side MTU 12V2000 M94, Twin Onan gen sets 20kw, V-drive port, V-drive stbd, Engine room, Secondary water maker, Primary water maker, Arid Bilge systems, Stern thruster, bilge pumps, Stbd Gyro, Port side gyro, External stairs to flybridge, Davit, Hardtop, Tender chalks, Life preservers under sunbed, Photo 101, Photo 102, U shape dining, Wet bar, Fridge, grille, sink, storage, Interior access door, forward seating, Upper helm, Photo 108, Photo 109, Photo 110, Impeccable finish, Manufacturer Provided Image:, Manufacturer Provided Image:, Manufacturer Provided Image:. 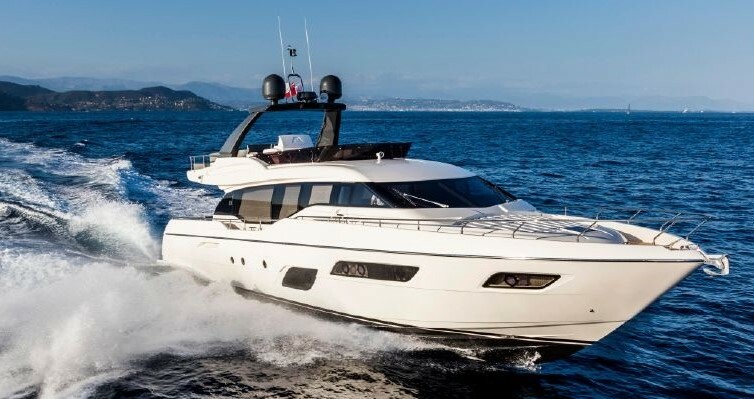 The value represented in this Ferretti 800 is incredible. You need to actually get on board this yacht to compare current conditions to the other Ferretti 800's on the market. This Ferretti is the optimal vessel for those seeking a near perfect boat. For starters, in 2016 the whole exterior of the boat was painted with awlgrip (Rollie,Ft. Lauderdale) due to a small imperfection there was on the gel coat. Secondly, this boat has 720 hours on the main engines ( MTU 12V2000 M94) and the owner purchased extended warranty which is still available. This can be extended as well. The twin 23KW generators are currently at 950 hours. All services are done by MTU certified technicians and the full-time captain. Twin Gyro stabilizers are great when you find that perfect spot to anchor for the night, they keep the boat dead still in the water for ultimate comfort. Aside from all these positive aspects, the boat has never been chartered nor has it traveled in rough seas, it has been treated like a family member since day 1. Boat was hauled out, all bottom services were done. Anti-fouling, prop-speed and zincs. Also serviced the bow thruster. Note to our fellow brokers: All MMG listings are now 50/50 split. SYS Yacht Sales is pleased to assist you in the purchase of this vessel. This boat is centrally listed by Miami Maritime Group.